On Wednesday, March 14, MHS students walked out of their classrooms in a show of support for the victims of the shooting at Majory Stoneman Douglas High School. 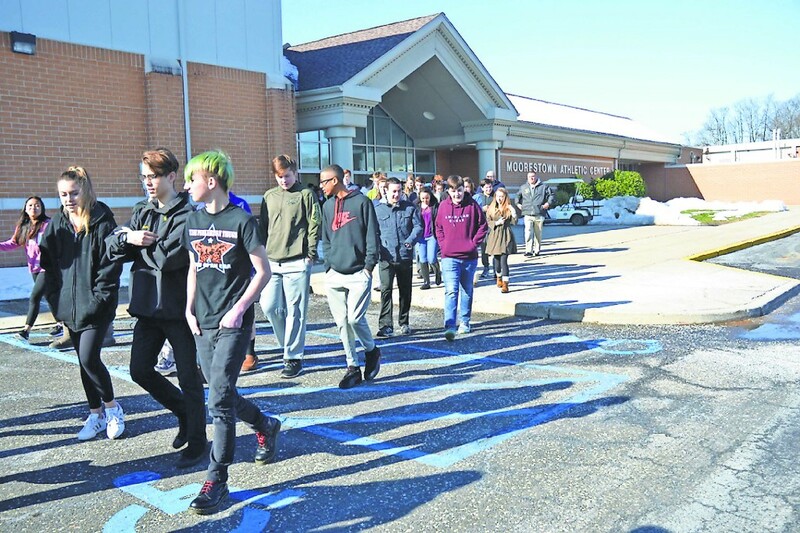 At 9:56 a.m. on Wednesday, March 14, students walked out the doors of Moorestown High School. MHS’ demonstration was part of the National Student Walkout taking place across the country at the same time. At precisely 9:56 a.m. on Wednesday, March 14, students stood up from their seats, filed out of their classrooms and walked out the doors of Moorestown High School. Their demand was clear: Put an end to violence in schools across the country. MHS’ demonstration was part of the National Student Walkout taking place across the country at the same time. The nationwide protest came exactly one month after 17 people were killed during a mass shooting at Marjory Stoneman Douglas High School in Parkland, Fla.
Moorestown students made their way to the stadium where they stood huddled together for six minutes of silence, which represented the time it took for the shooter to take 17 lives. Student speakers subsequently spoke for 17 minutes to commemorate each of the victims. Senior Evan Lis said the walkout was, in a way, a tangible link between MHS students and Marjory Stoneman students. “It’s a physical connection between us and them,” Lis said. Senior Ella Peterson read a list of every school in the country that has had an active shooting on its campus in 2018 thus far. She said in three and a half months, there have been 14 shootings. 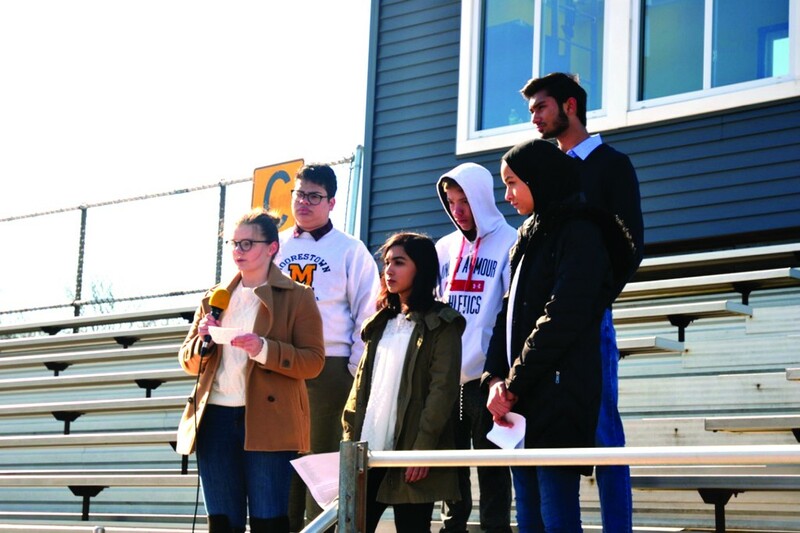 The walkout’s organizers delivered speeches from the stands of MHS’ stadium about putting an end to violence in schools. From row L to R: Ella Peterson and Naquia Unwala. Center row L to R: Carlos Feliciano, Summer Maher and Matt Button. Back row: Ashrit Verma. “This is one of the great tragedies of our time,” Peterson said. She said after each shooting, the phrase “never again” permeates but nothing changes. Peterson said they will be the generation that says “never again” and ensures that phrase comes true. Junior Matt Button spoke about his personal connection to the Parkland shooting. He said his cousin, Luke Hoyer, was 15 years old and one of the the first students shot at Marjory Douglas. Sophomore Summer Maher said she was 10 years old when the shooting at Sandy Hook Elementary School in Connecticut took place. She said that marked the first time she was afraid to go back to school, and she recalled feeling helpless at the time. Maher said she no longer feels helpless. She said she and her fellow students walked out of class to break the cycle of violence and in recognition that they can’t let these mass shootings go on. 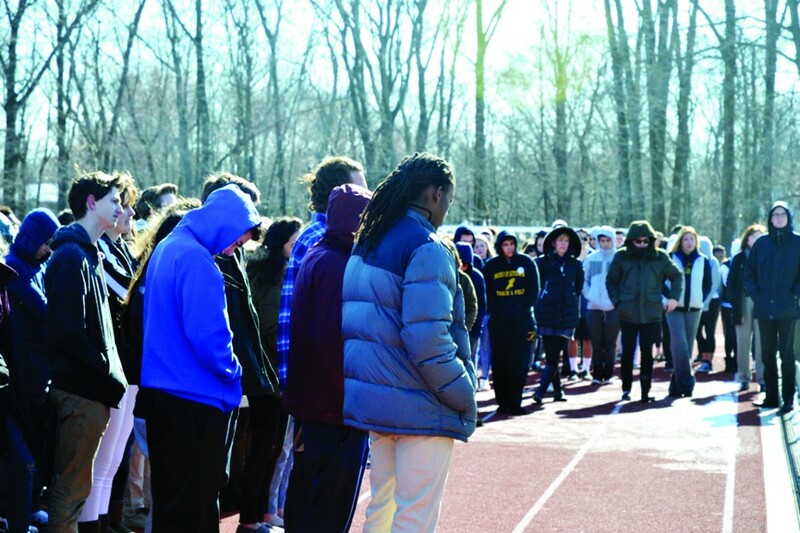 Students gathered on the track of the Moorestown High School stadium and listened in attentive silence to the speeches given by their peers. The students walked out of their classrooms on Wednesday, March 14 to protest violence in schools. She said the movement to end gun violence doesn’t end with students walking out of their classrooms. She asked her fellow students to take action every day in the simplest way possible — by being kind. Junior Carlos Feliciano said he was similarly shaken by the events at Pulse Nightclub in Orlando. He said as a member of the LGBT community, the shooting left him fearful. “I was scared that one day I’d be holding hands with someone I love, and somebody would perhaps decide to do the same thing to me,” Feliciano said. “In 140 characters, we can start a revolution,” Feliciano said. Sophomore Summer Maher places a white paper flower into a pile. A group of around 20 students assembled in the cafeteria of MHS on Tuesday, March creating white paper flowers with students’ reflections on mass shootings to honor the students at Parkland. Peterson, one of the event’s organizers, said they wanted the walkout to be bipartisan, so rather than making their protest about any one policy, they decided to make it a broader call for action to end violence in schools. Peterson said after hearing about the national movement, she approached Principal Drew Seibel and Assistant Principal Bob McGough about organizing a walkout at MHS, and they were immediately receptive and supportive. She said they put her in touch with other students who had approached the administration, and together, the group of six students got to work organizing Wednesday’s walkout. “It’s been very much a collaborative effort and a mobilizing effort for students who weren’t necessarily connected outside of this,” Peterson said. Peterson said she heard some criticism in the days leading up to the walkout whether the event still constituted a protest if they were working with the administration. She said any protest on the street requires a permit, so by that logic, it only made sense to notify the school. 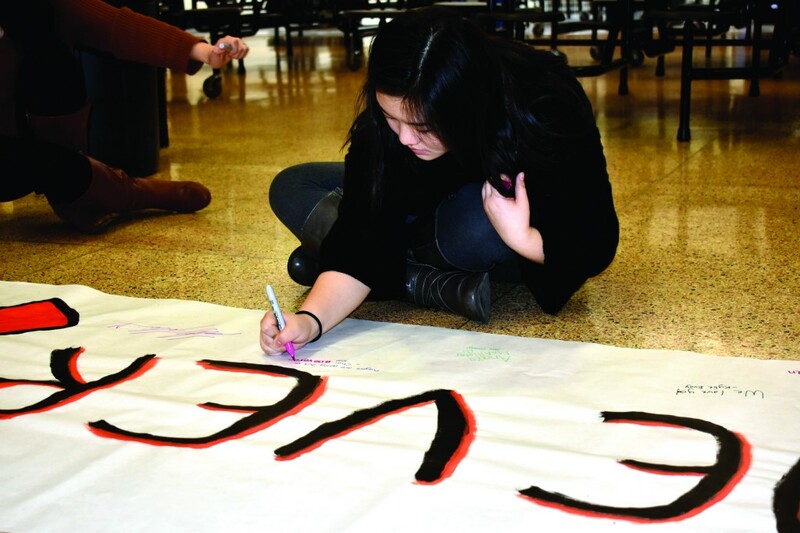 Sophomore Chai Kim works on a banner that reads “never again” On Tuesday, March 13. The banner will hang in the halls of MHS to honor the victims of the Parkland shooting. She said, additionally, students are protesting the fact that schools are unsafe, so it only made sense to try to keep the protest organized, and she was glad to have the administration’s cooperation to ensure students safety. 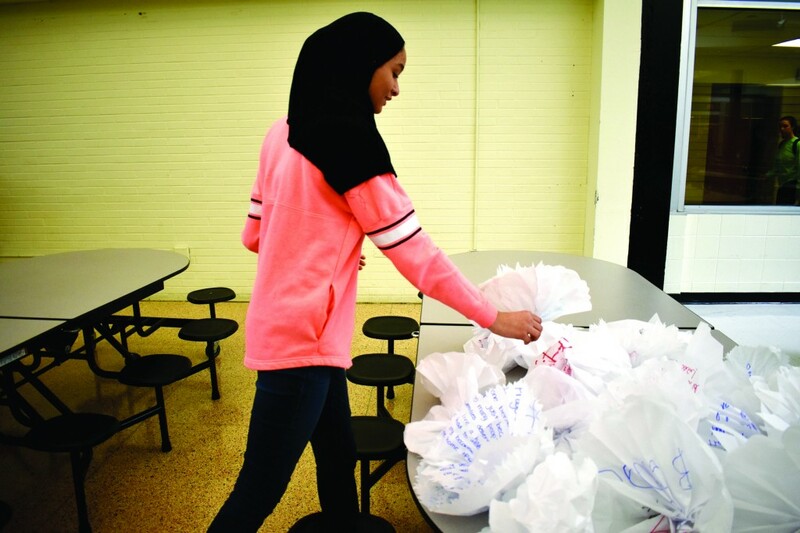 “We are so proud of the group of students who organized and took action and our student body as a whole for their participation,” McGough said. As the walkout came to a close, Peterson expressed her gratitude to the students assembled on the stadium’s track who hung on the speaker’s every word in attentive silence. “Thank you for dedication to the belief that we can make change,” Peterson said.